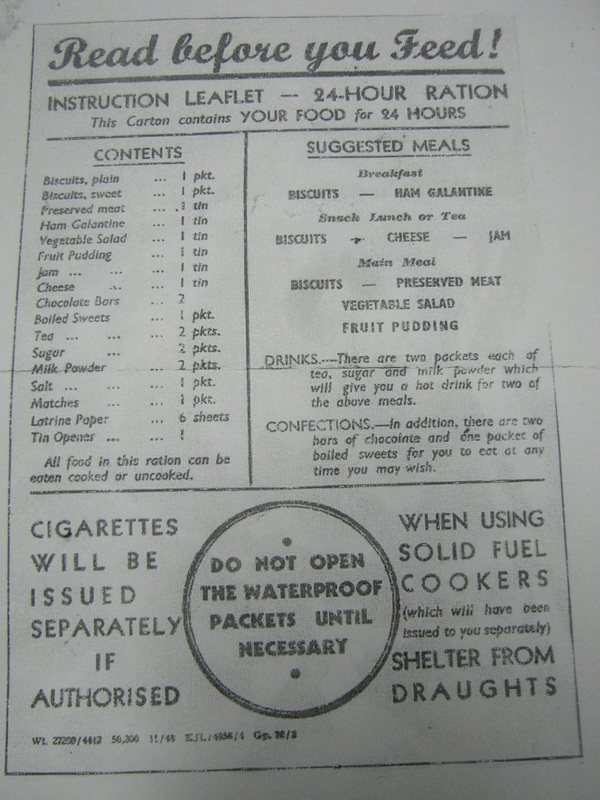 The 24 hour ration was issued out under special conditions, such as D-Day. Because it is relatively easy to copy, and it lasts for one day, it's popular with reenactors. 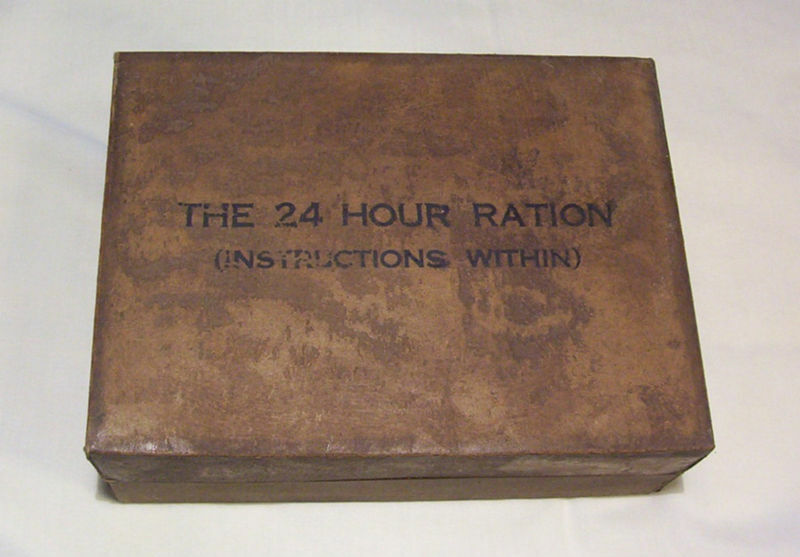 Here are four photos of an actual 24 Hour ration box, so you know what it should really look like. 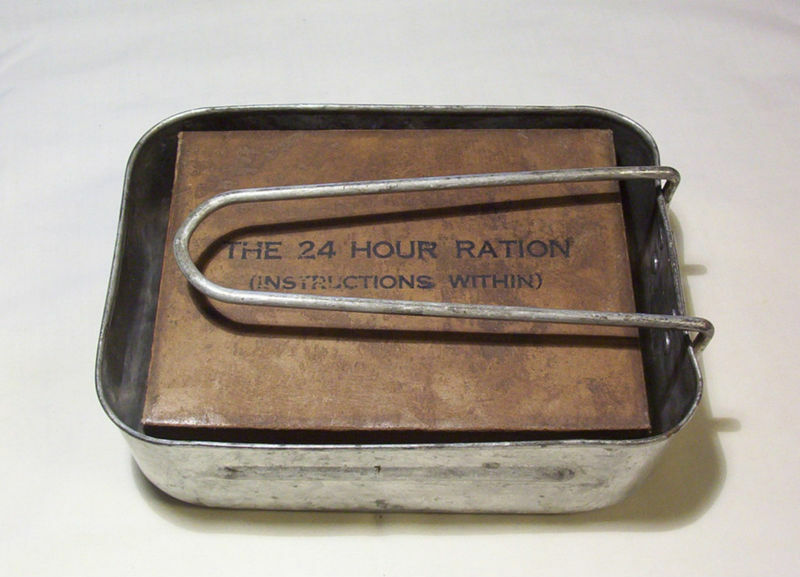 The 24 hour ration fit inside the standard mess kit. 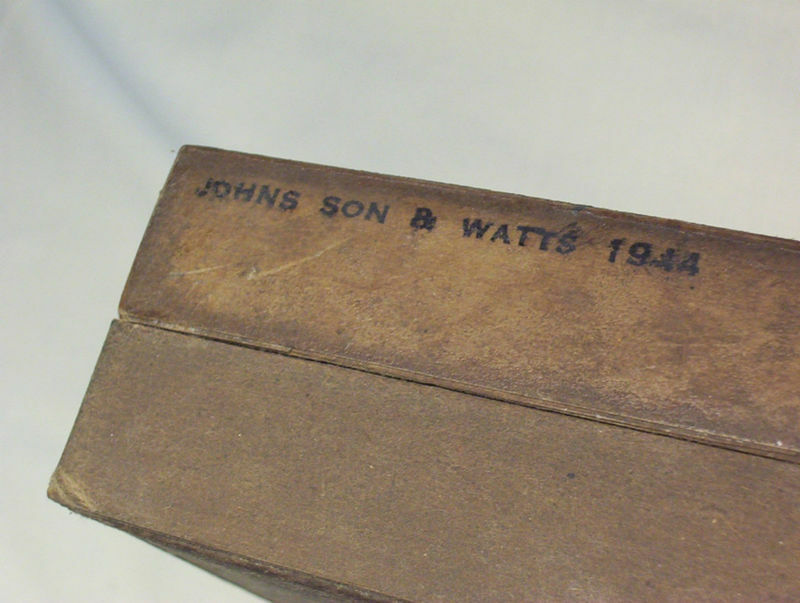 The box was made similar to a small shoe box, and was coated in wax to waterproof it and presumably to help make the contents stay fresh longer. There was more than one manufacturer, but contents were similar between manufacturers. The box to the right had a contents an instructions label attached inside the lid. 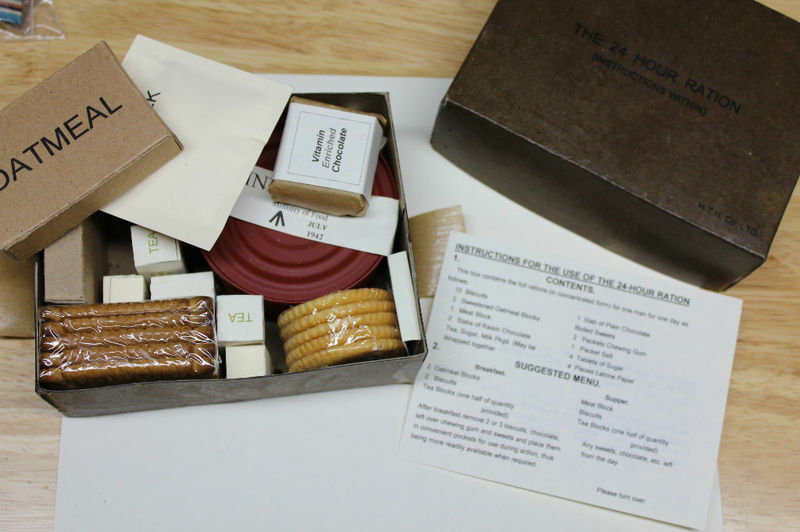 The photo to the bottom right is of a reproduction 24 hour ration that you can purchase to save the time and effort of making them yourself. 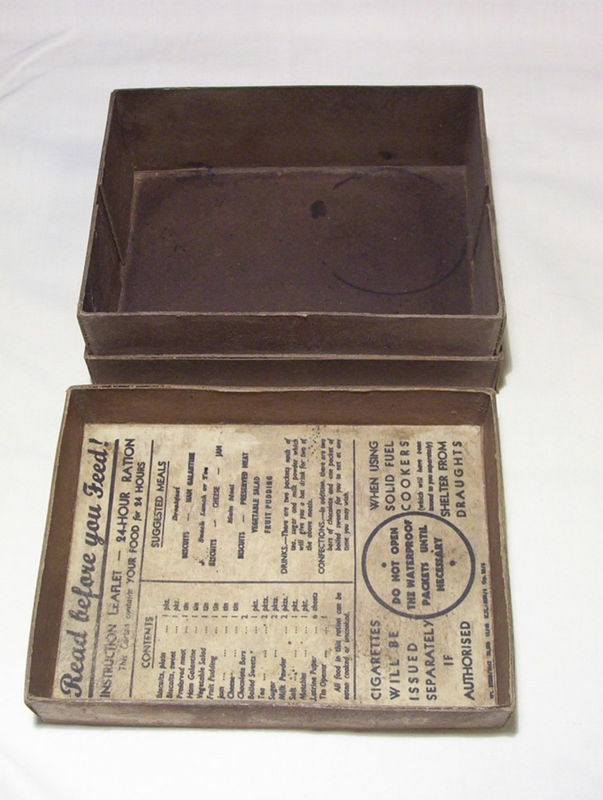 It has a different instruction sheet than the original at right, but the contents of the original would have appeared similar those of the reproduction. The instruction sheet below is a photocopy of one of the instruction sheet style shown at right. The following three pages were taken from another web site several years ago. I found them in my files, but don't have notes on the website, although I believe they are from Harlan Glenn who used to run "King and Country", or possibly from the old reenacting unit "22nd Independent Parachute Company". If you can identify the source, please let me know by using the information request on the home page so I can give proper credit. You can see from the photo of the replica ration at top right that many of the labels are simple print, and you can make them on any word processor and print them. Other labels are available from the Repro Rations link below and other vendors on the internet, and from the Visual Collector link below that you can print up for free. Like wearing the uniforms and using the weapons and equipment of soldiers from the past, eating the foods they ate also helps one to appreciate the day-to-day lives of these men. I'm incuding some photos of some original rations I used to have in my collection as examples of what the real thing looked like. Keep in mind there were hundreds, if not thousands, of products produced by the civilian sector to feed the troops, some with militarized or generic labelling, some straight off the shelf. These are just some examples. 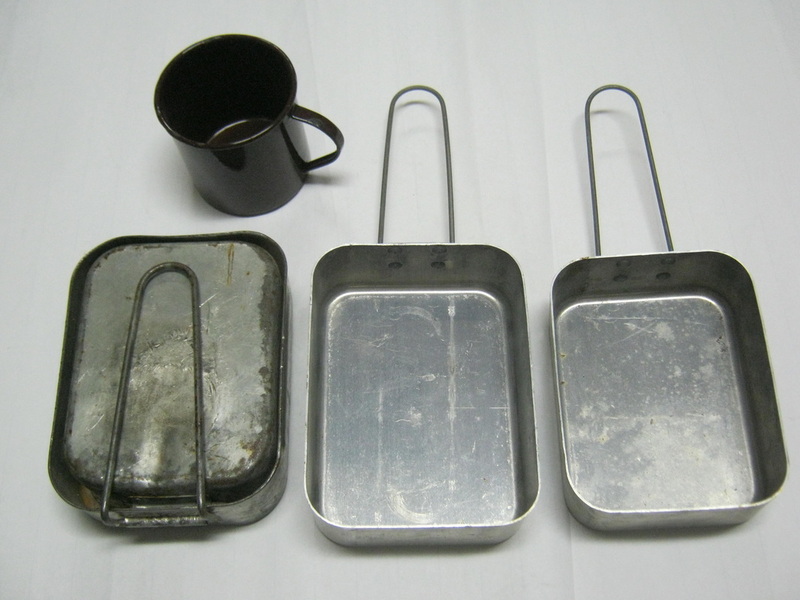 In the above left photo, are a wooden spoon and fork contained in some rations. In the middle of the same photo, can be seen a can opening key like those found on corned beef cans, and a "P38" type can opener with folding cutting tooth and bottle opener, with a hole so it can be put on a string around your neck or whatever. These are laying on top of the unfolded packet they both come in. To the right in the photo are cardboard can lids, to be used over open cans when only parially eaten. At the top of the photo, not legible in this picture, is a box of dehydrated pea soup mix. Below the openers is a box of deydrated chocolate drink powder mix. Below that is a stick of WW2 Wrigleys gum, the only major difference from the modern being that the inner wrapper is waxed paper instead of foil, for wartime economy of resources. Also seen are a generic can of butter, and a brand named can of strawberry jam. 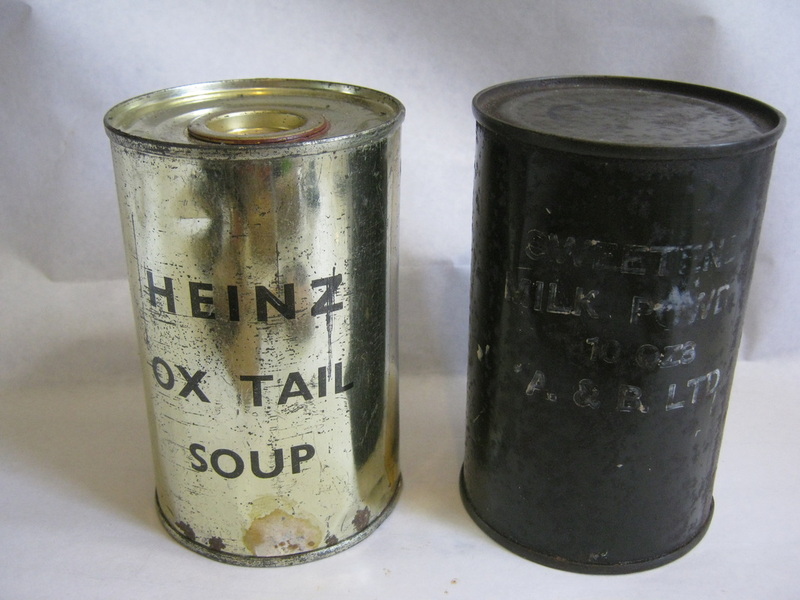 In the photo above are seen a can of self-heating ox tail soup produced by Heinz. There were half a dozen varieties of self-heating soup of this type. The small pop top on the can uncovered a parafin and cordite wick, which when lit gave quite a show and heated the soup quickly. To the right of it is sweetened milk powder. In the photo at left can be seen the reverse of the soup can shown above, showing the instructions for heating. To the right of it is a can of hard-tack, also known as biscuits, unsweetened. Known today in the U.S. as crackers. 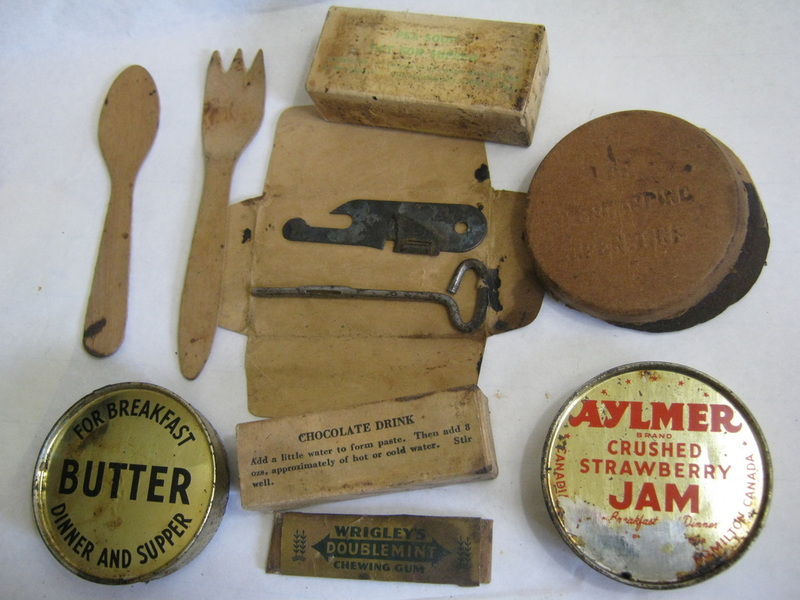 At right are examples of replica rations using wartime labels and boxes. Canned meat such as spam, corned beef and tuna, as well as chicken and ham in the tuna-sized cans, haven’t changed much since WW2. Simply replacing the label with period-correct labels gives you an authentic WW2 food item. The same applies to stews, vegetables, condensed milk and many other canned goods available today. Other items in the photo, such as boiled sweets (what we call hard candy), licorice bits (“Good and Plenty”), can simply be put into a box made from photo-copying period printed labels onto heavy card stock at Kinko’s. The tea ration and boiled sweets and matches tins are “Altoids” tin boxes spray painted green with the lettering made from rub-on transfer letters that you can get at stationary stores and craft and hobby shops. The cigarette tin at the top of the photo is a tin "Bandaid" box, also painted green and with transfer lettering. The cheese spread can is a musket percussion cap can with transfer lettering. 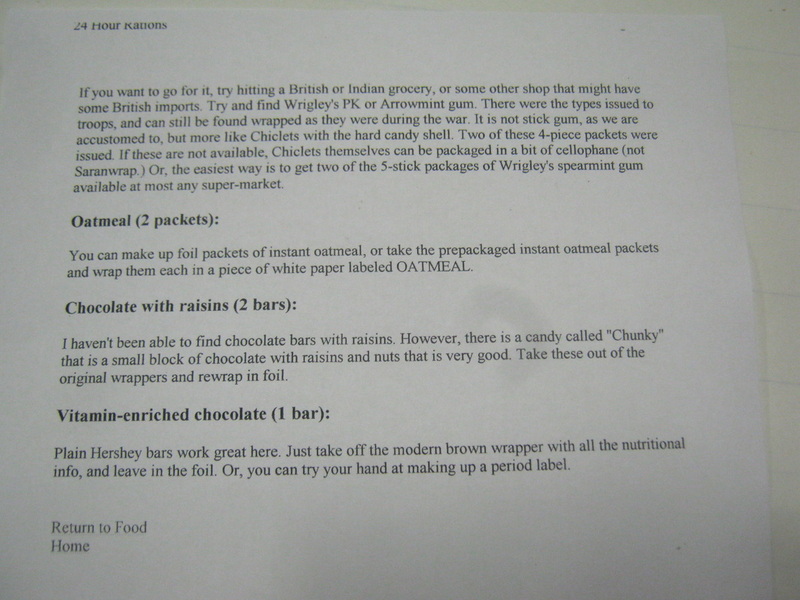 These are just examples of what you can do to make period rations. 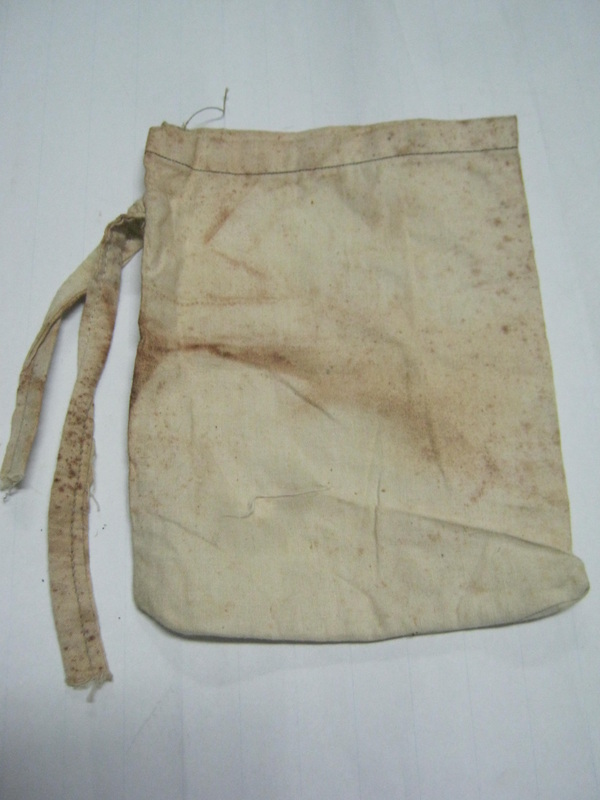 At left is a linen ration bag. Loose rations like fresh bread and biscuits and whatnot would be put in these. 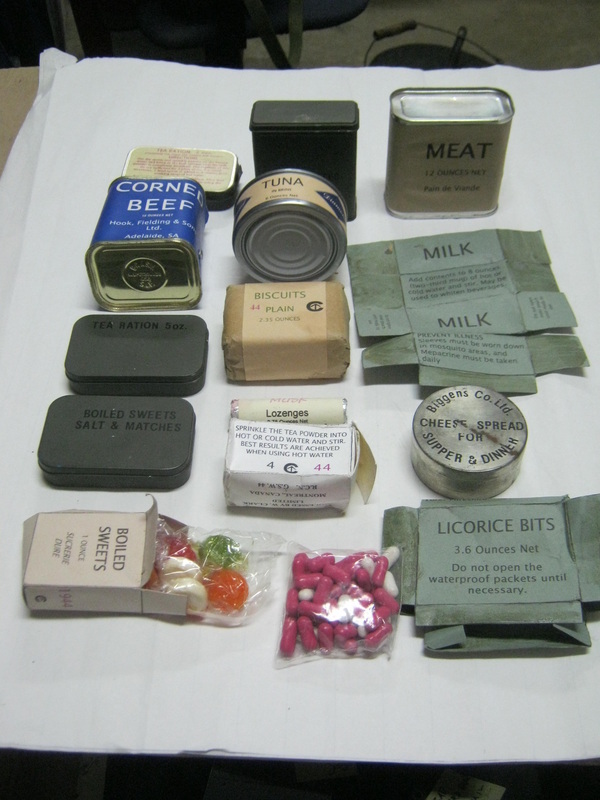 To the right is a chocolate and boiled sweets tin, and below it an emergency ration tin. 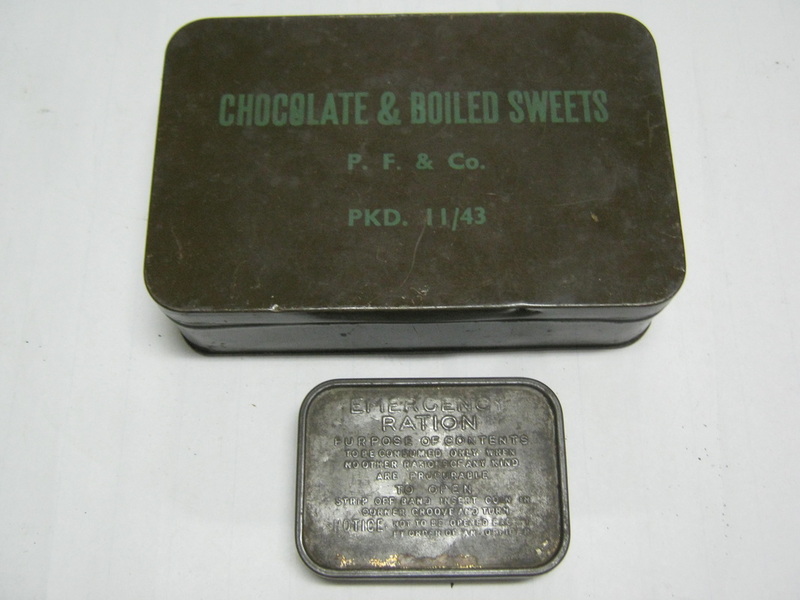 Chocolate and boiled sweets (hard candy), because of their vitamin, caffein, and sugar content, were well suited to keep soldiers' energy level up when more substantial food wasn't available, and were easy to pack and distribute. 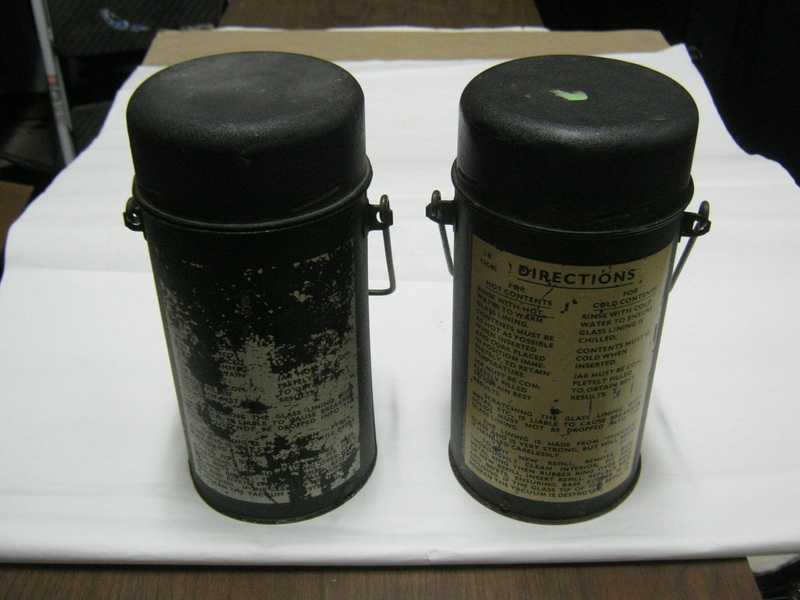 Wartime ration tins such as those at right are still fairly commonly seen in the collectibles market. Since they were handy little storage boxes and re-usable as well as re-sealable, they've tended to show up fairly often. Look in the usual places, ebay, online militaria dealers and antiques, etc. To the left are two mess tins, one stowed and the other opened to show the two tins. 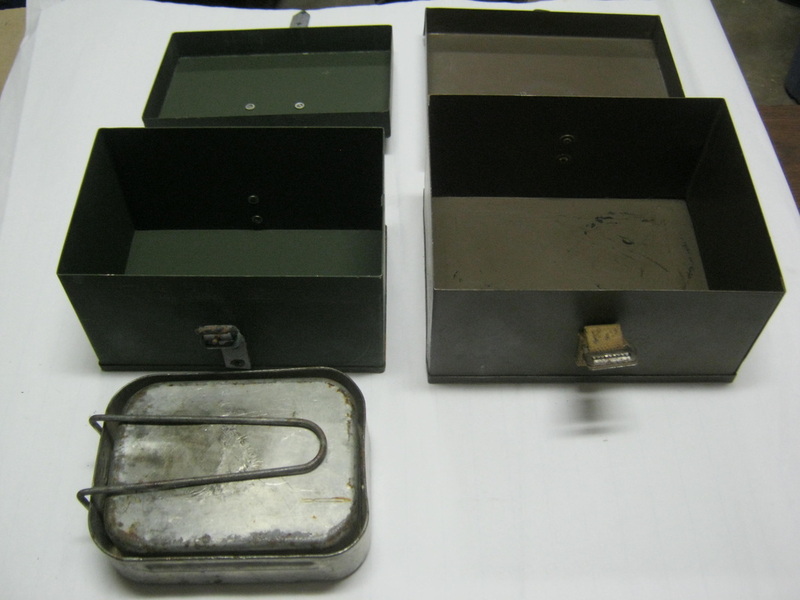 The left is an early war mess tin made of tinned steel, and the right is a late war aluminum mess tin. 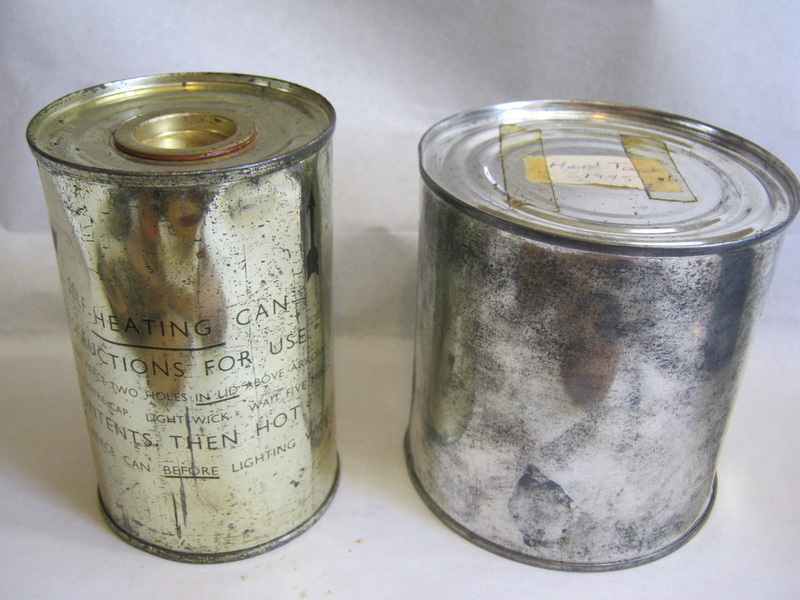 Post war mess tins are identical. A mug is shown to show the relative size of the mess tins. 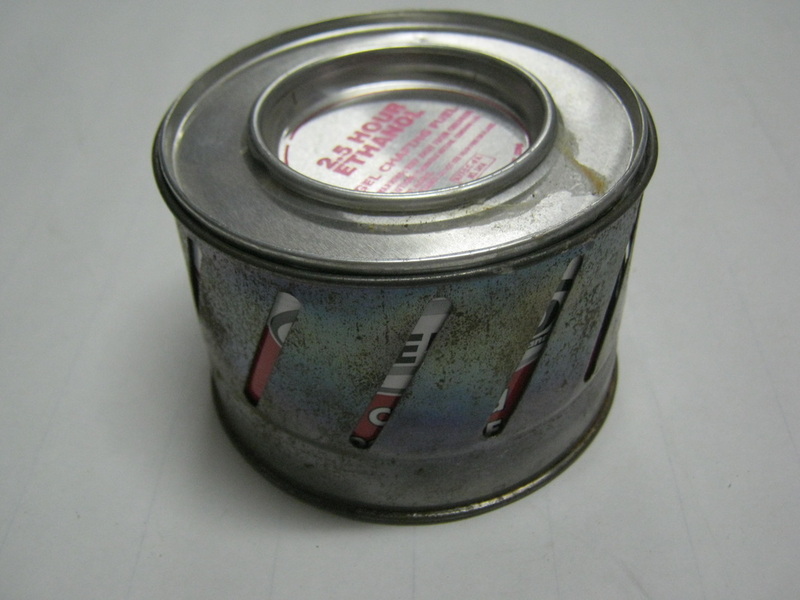 When getting your mess tins, ENSURE that you get late war or post war ALUMINUM tins. If you put a tinned steel mess tin on a stove, the solder can get into the food, and lead solder and the human stomach are not compatible. Above is a collection of British Army issue knives, forks, spoons and clasp knives (jack knives). These are easy to find on ebay and various surplus stores and online stores. The cutlery will have a broad arrow mark if it is british issue, and normally a date. 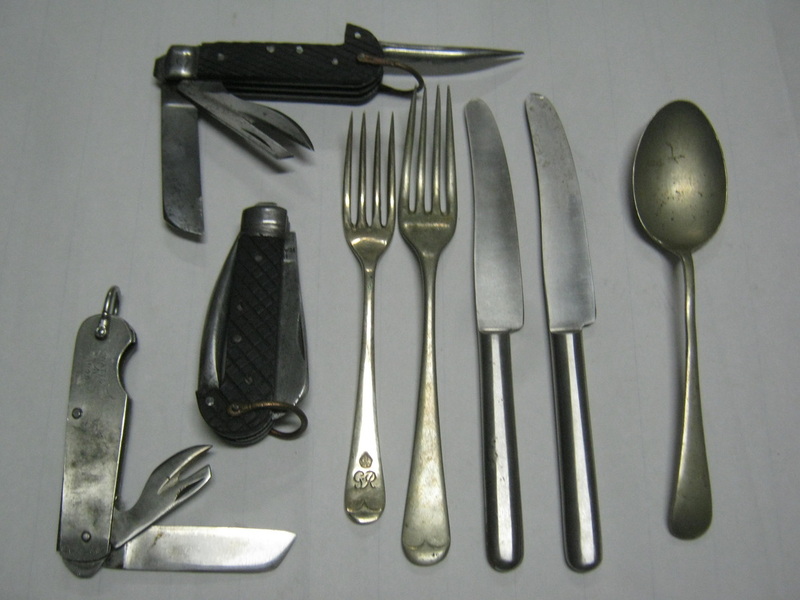 There are various patterns and manufacturers of cutlery and clasp knives that were issued. Clasp knives typically have a cutting blade, a can opener, a bottle opener, and sometimes a marlin spike, for working with rigging. Above left is an issue set of nesting cutlery. The knive, fork and spoon nest together, and are held together by a folding clip on the handle of the spoon, seen clipped around the handle of the knife in this photo. 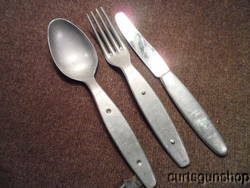 Above center is the same set of cutlery, separated and ready for use. 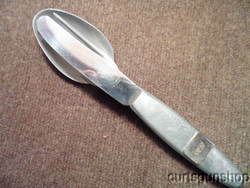 The clip can just be seen at the bottom center of the photo on the spoon handle, folded out. At left are a pair of issue mugs. Again, various patterns and manufacturers so there are subtle differences in circulation. 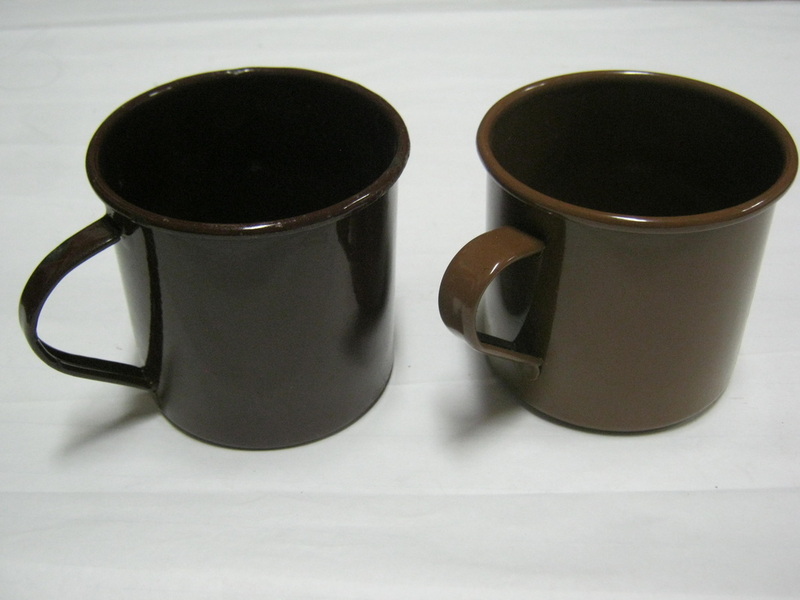 The left mug is an actual mug, and the right mug is a reproduction. White mugs were also common, as they were the standard before the brown mug was introduced during the war. 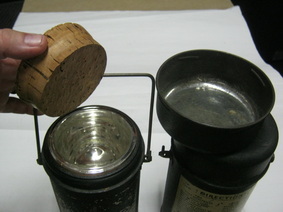 Below left is a “Sterno” stove and fuel can. Sterno is available at any store that sells camping and sporting goods, as well as cooking stores, as sterno is commonly used to keep food in chafing dishes warm on buttet tables. Here the sterno can is stored inside the stove. The stove is a simple slotted metal cylinder. They can be bought together or separately. To the near left the stove is mounted on top of the can, which is held in place by a simple lip pressed into the stove for that purpose. Period labels for the WW2 sterno cans are available online on the links below. The sterno can here is shown without a period label, so you can know what to look for at the store. These small stoves would be used by an individual or pals to brew tea or warm items when collective cooking wasn't available or practical. 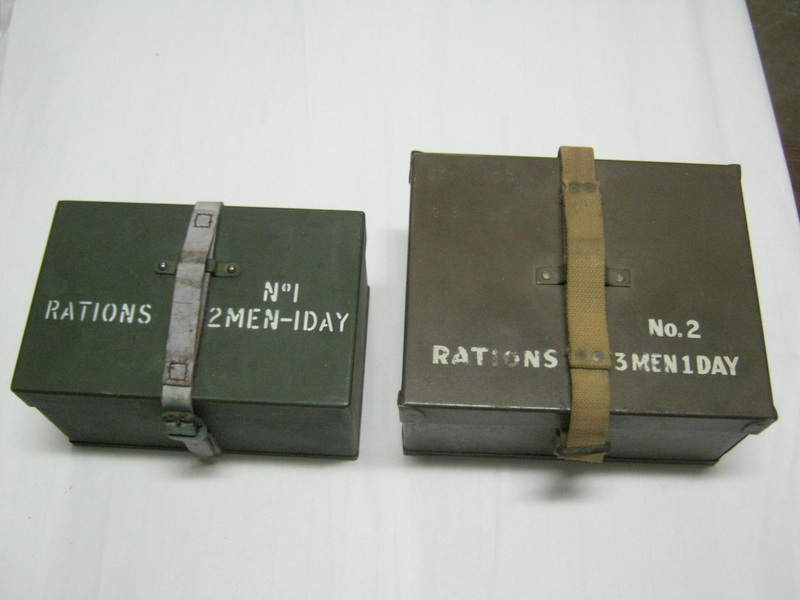 To the left are two armored fighting vehicle crew ration boxes. The far left box is a two man for one day box, and the near left box is a three man for one day box. 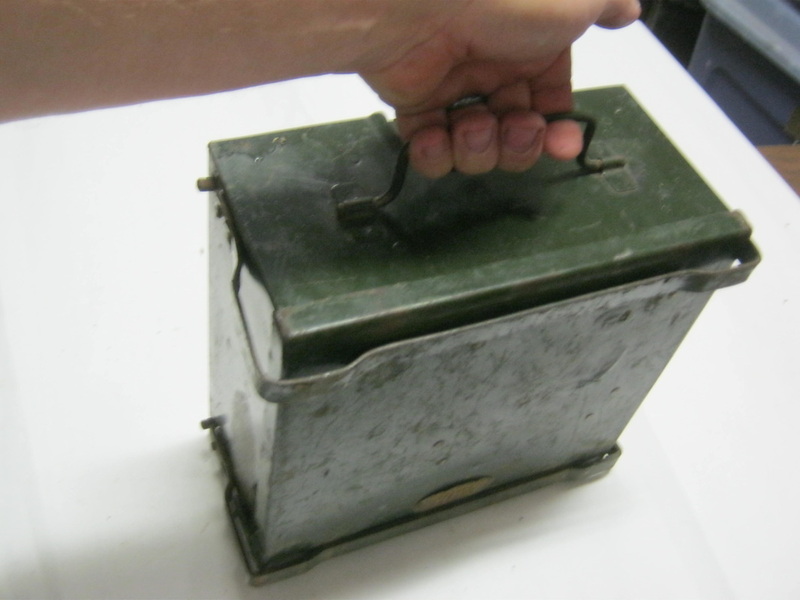 The box on the left is a post war box, the box on the right is dated 1943. Paint varied, as well as the straps, either leather or web. These boxes could be pre-loaded with food by the supply echelon, and handed to the crews when re-fueling and re-arming. The previous day's empty boxes could be turned in at the same time for re-loading. 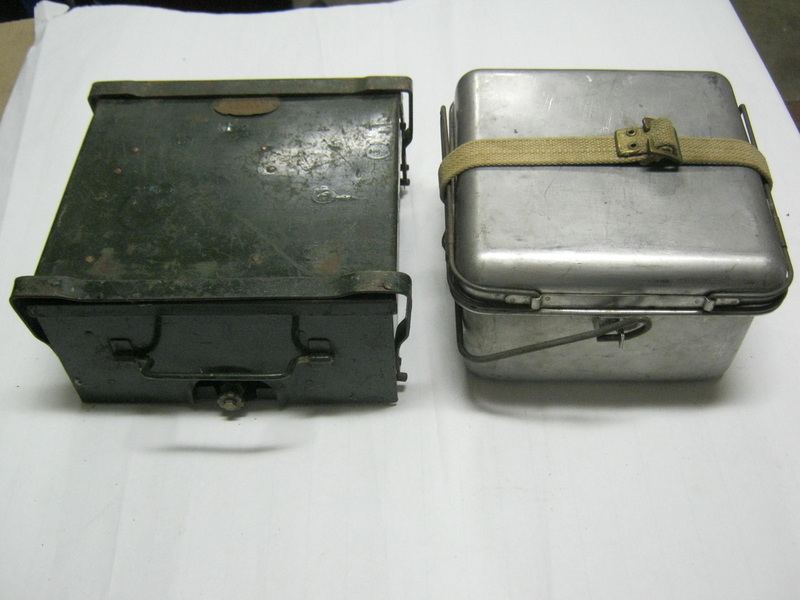 At right are the same boxes, open, with the mess kit in the photo to show scale. At left are two thermos bottles. The left is date 43, and the right is dated 52. The left bottle is made by “Thermos”, and the right by “Vacco”. Identical except for the dates and manufacturers’ names. These bottles were issued so that glider troops and paratroops could have hot beverages while in flight in the very low temperatures experienced during transport to the drop and landing zones. A handy item to hang onto for later use. 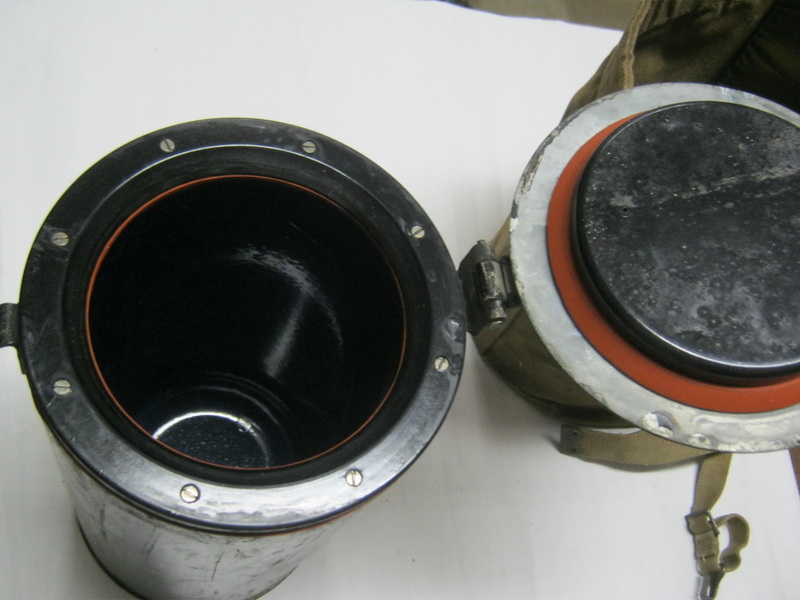 At right is the thermos bottle with screw on cup/lid removed, and cork removed, showing the glass liner. It is wise to stuff a pair of socks or some other compressable item in the lid when closing the bottle, to keep the cork from coming loose. 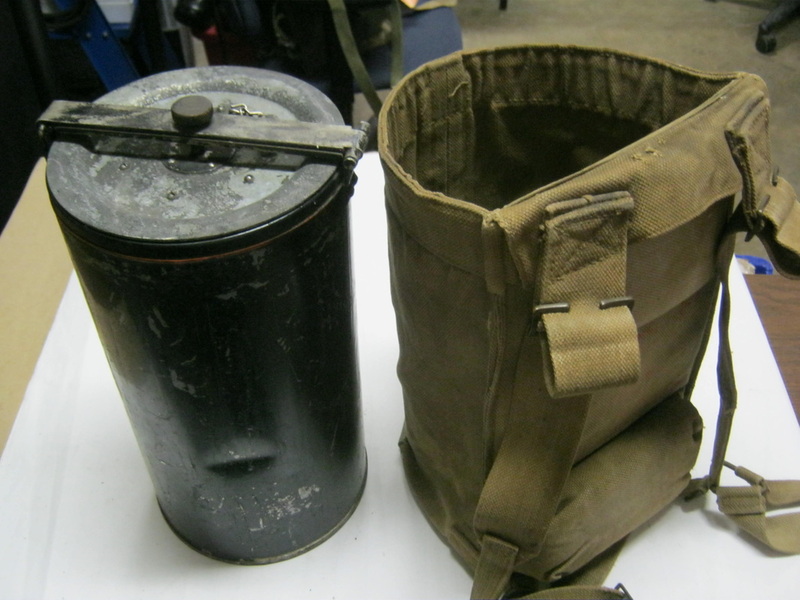 To left is shown the large thermos container for holding large quantities of food or hot drink, along with the padded carrier to the near left, for carrying the container on the back while moving dismounted. To the right is the large thermos with the lid open. The lid has a rubber seal, and a latch with tensioner on a cross bar, which can be seen in the photo to the left, to ensure a very tight seal to keep the contents warm and prevent spillage enroute. To left are shown a No. 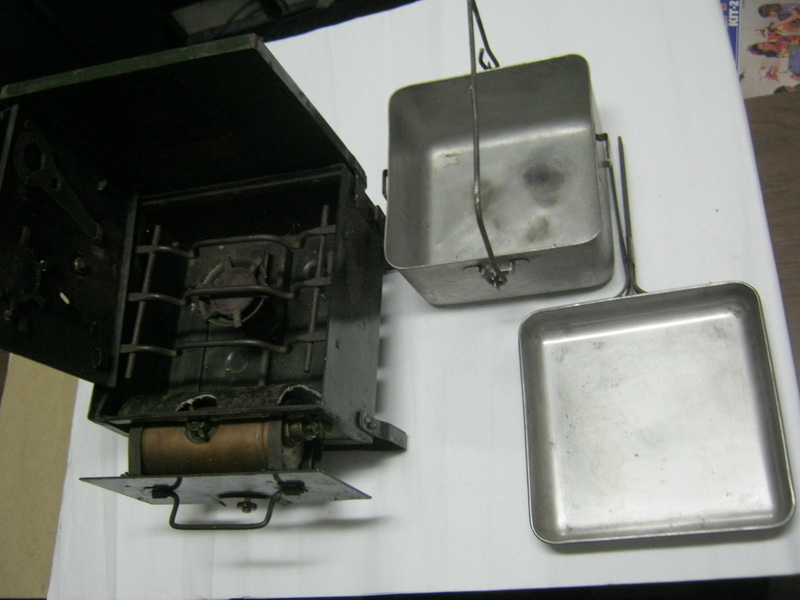 2 Mk II “Safety Cooker” petrol (gasoline) stove and the mess cooking set designed to fit exactly the stove top. The early war stove had a fuel tank that was stowed inside, and then attached on the outside for operation. The later war stove was designed with the bottle permanently attached inside the front wall of the stove, which slid out like a drawer for operation. To right are shown the No. 2 Mk II stove ready for operation with the cooking set separated and ready for cooking. 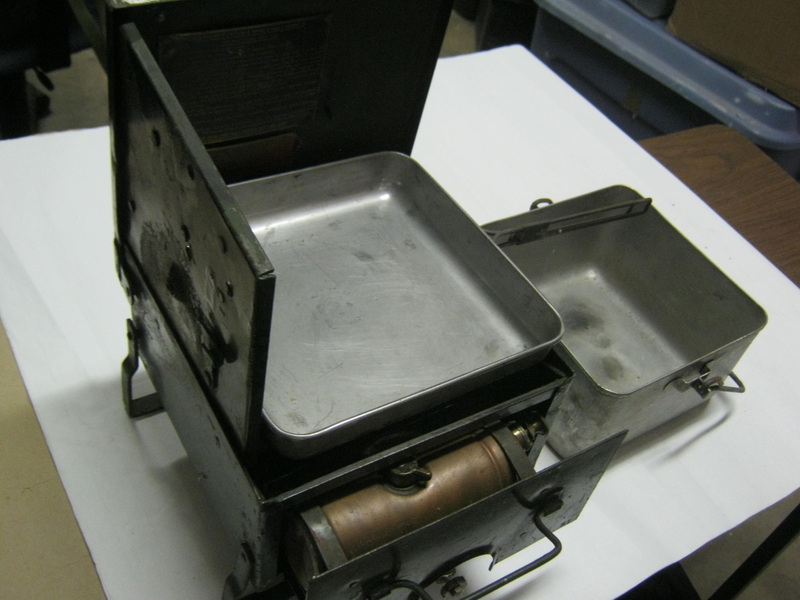 The lid of the stove is held in place for transport by folding legs, which are unfolded and locked into place for operation. The lid is folded upward, and a folding wing attached to the lid is folded out as a wind break to shelter the flame and pots from wind. Stove tools are attached to the wing for storage. 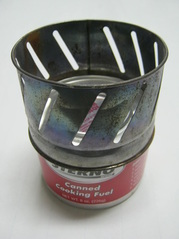 The fuel cylinder can be filled with modern “Coleman” stove fuel instead of gasoline, a much safer fuel to work with. The pot has a folding bail handle, as does the frying pan, with a two-part folding handle. To lower right is shown the stove again, with carrying handle up and held by a hand to show scale. 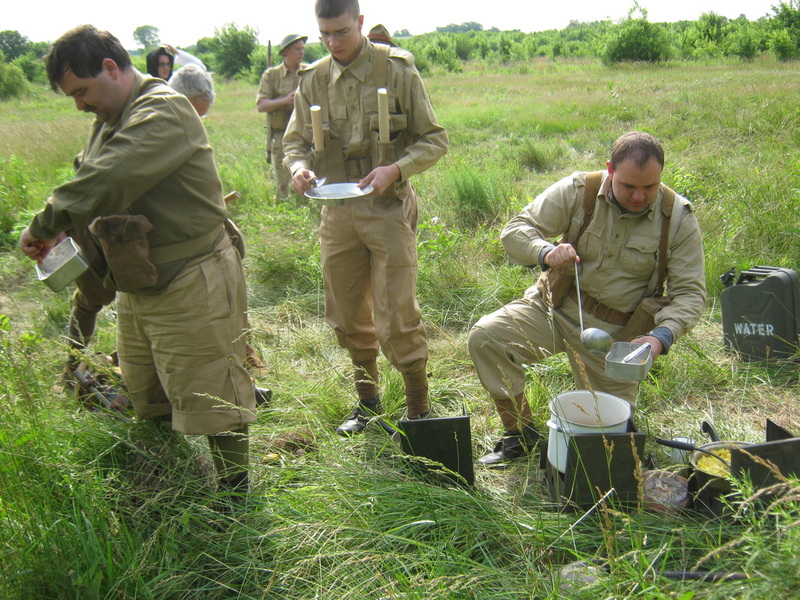 The 6th AARR has enough authentic field kitchen equipment equipment, consisting of both original and reproduction items, to cater both small and large reenactment events. 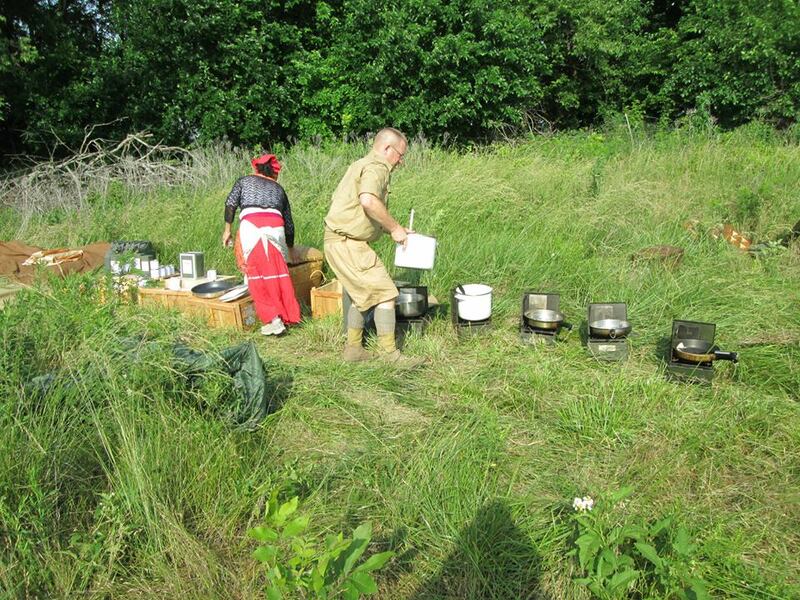 The photos to left and right show a variety of stoves, compo crates and whatnot in operation at the "Battle of Crete" reenactment event at Parsons, Kansas in June of 2014. 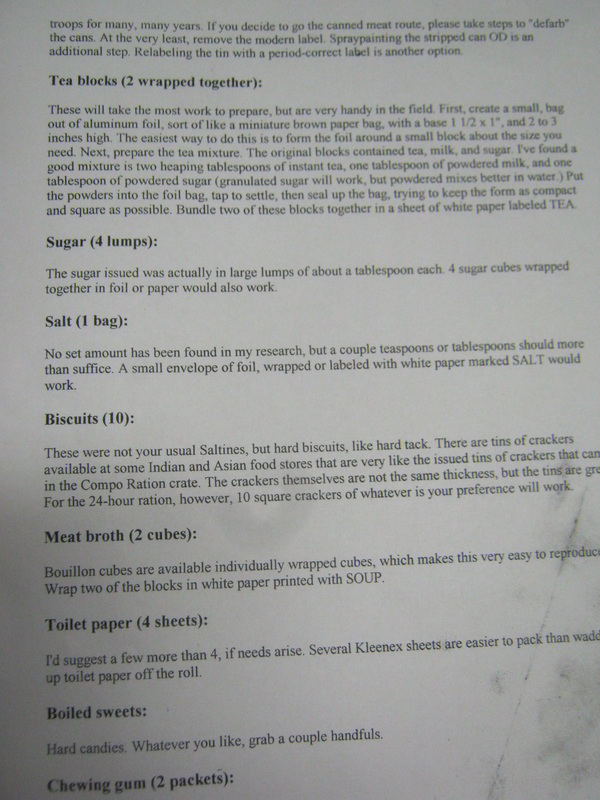 Link to Visual Collector web page where you can print up period labels for your rations and other items. 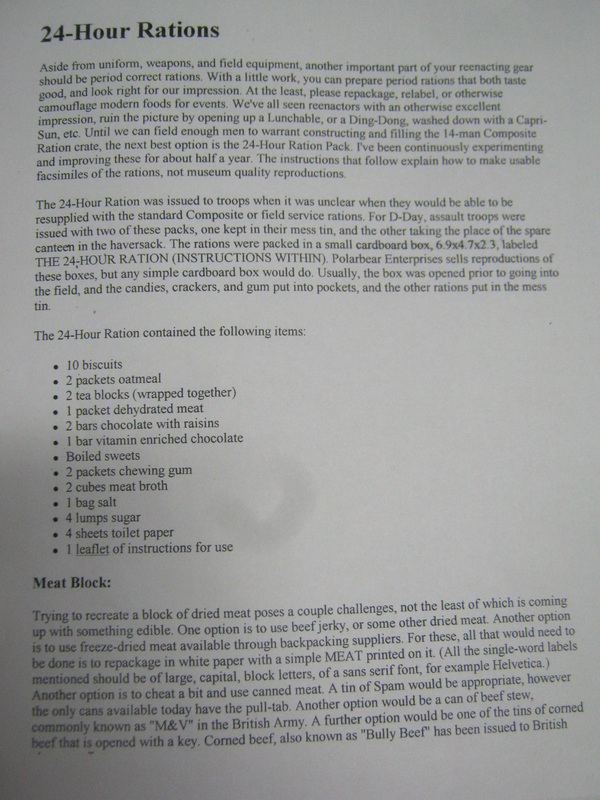 Link to Repro Ratons, where you can buy replica edible period rations. Description of and suggestions for reproducing Compo Rations from the Green Howards reenacting club. Interesting discussion on WW2 TALK on rations with WW2 vets chiming in with their memories.